ONZ Architects together with MDesign, Lola & 24H Architecture won 2. 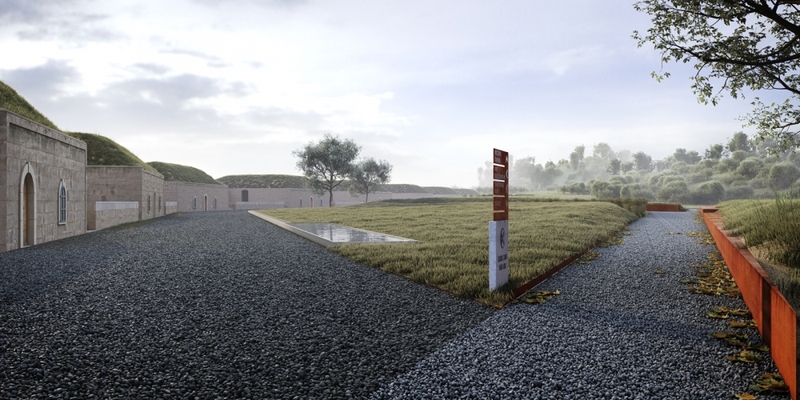 Prize in Gallipoli Peninsula Historical Natural Park Areas of Focus Ideas Project Competition. This design proposal creates a new balance between everyday life, the extraordinary history and the beautiful nature. It offers the chance to shortly forget about everyday life and to concentrate on the war and the nature. Remembrance requires not only acoustic silence, but also visual silence. Therefore the design approach is minimalistic. Each memorial site is unique and tells its own part of the total story. They can best be described as an ensemble of elements individually can be found on many memorial sites, but always in a different form and configuration. The elements are: memorial, burial, plaquette, parking, shops, square, road, path. Since the shape and position of many of the elements is fixed, and only some elements can be moved or transformed, it is not possible to create more coherence and recognisability in the ensemble. What can be done, is shaping the connections in a recognisable way: the paths that connect the different elements. A recognisable path network is laid out slightly sunken, accompanied by corroded steel edges, wild flowers, signs and other elements. The sunken path brings visitors closer to the earth of the landscape, and creates a focus on the route ahead, while paths in the surroundings stay unrevealed. It creates a 1 on 1 relation with the landscape. The earth that is excavated to lower the path is put at the sides, creating a soft scratch in the surface of the landscape. The paths are never steep, and accessible for wheelchairs. Therefore on sloped terrain the paths make sharp angles, increasing the length of the path and the distance between the different memorials. Along the track, wild flowers are sown, selected to blossom when the ceremonies take place.